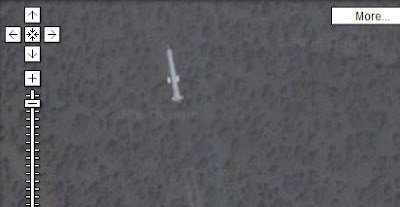 Google Maps appears to have caught a missile in flight over Utah. Those who know about this sort of thing say the missile could be an AIM-9 Sidewinder. Note to self: do a little more research before posting. Update: Oh well. It seems I'm a little behind the times with this story. Google Sightseeing ran this story last year. If you look really closely at the image you can see that it is actually a plane with black wings and not a missile at all. Which isn't nearly as exciting. Dunno, I think I can see dark grey wings.. airplane? MD80 or similar?